Many people walk out of the job interview feeling two ways, either they know they nailed it or just fully bombed. Whichever is the feeling between the two, you end up mulling about what you answered and how the interviewer reacted to your answer. Whether you are selected or not, is the question that remains unanswered for the next few weeks, until the reply comes. How to Know If You Got the Job? The following mentioned are few tips on how to know you got the job and some signs you got the job. Your answers build interest in the interviewer and he or she feels happy listening to you. This can be known only when your answers bring a smile and there is no sign of frustration on the countenance of the interviewer. This is one of the best signs to know whether you are going good or not. Sometimes, the interviewers make no expression to keep you bewildered, but still, some of the gestures make you realize that you are selected. Sometimes, we see that the interviewee comes out of the job interview very soon. So, most of the time we make an idea that the interviewee might not have answered up to the mark that interviewer ended up with the person. So, it is also one of the ways to know whether you performed well or not. If the interviewer holds with you for long, means for more than the time assigned, then it certainly means the panel is interested and you might get a positive reply. When the interviewer ends up asking professional questions and continues with some normal day to day chit chat with you. When the conversation is no longer more about your experience but goes more on the personal level, then it is a positive sign. If the conversation turns into a personal bonding, then it is a signal that they are interested in considering you in the company. So, if something like this happens then chill. Experts say that if the interviewer makes use of your name, number of times during the interview, then it means they are picturing you as an employee in their organization. Also if someone is using your name it means they are making a connection with you. So, it indicates they are already envisioning working with your vision and ideas in the company. If in case the hiring manager takes you on the official tour and also makes you introduce with the office employees, then it means they are happy to interview you and are ready to offer you the role. In most of the interviews, the managing interviewer asks one of their employees to give you an office tour, but many times, they themselves also move along with you. So, if this kind of situation arises, means they want you to be a part of their company. The non-verbal actions are stronger than those of the words. So, if your eyes come to the notice of any non-verbal signs like smiling, nodding and asking some more questions which you think are not valid but still, they are interested in knowing. Then, it is certain that they are happy to know you both personally and professionally. When the interviewer is done with the valid questions and he or she is continuing to make the interview go little longer by introducing you the additional decisions that they would make in the near future, then it is a green signal that they are wishing for you to say yes and work in their company. So, you must understand that if the interviewer is sharing their decisions to be taken and the current goals then it certainly is a big yes. The companies follow the strict time frame, but if it takes a little longer to recruit the right person, it is not a big deal for them. Any company would like to spend more time if they have to hire the right individual. So, if they are taking longer with you, and the HR ends the interview and ask when can they hear back from you, it’s a good sign you got the job. Also, if they are providing you a firm date, then it is a sign they are showing interest in you and probably you are that one candidate they have been searching for. If the interviewer hands over their card and the phone number, asking you to contact; they are making sure you stay with them or in touch with them so that they can hire you in their company. It means they are making sure that you are engaged. When they are inviting you to follow back, it is a great signal of positivity. They might want to ask some more questions regarding you and your preferences. So, if you think some questions are pending from their side, it is yes. If the interviewer tells about their company’s challenge and say that they believe your experience would help to achieve and solve that. Then you need to put a smile on your face as it is a nod for hiring you in the company. If the company’s next challenge is put forth you and a big picture is presented to you regarding that, it means something special in you has already impressed them. So, this is also one of the signs which say that you have the potential to get selected. The first obvious thing is that if you went to give an interview, means you were already interested, then there was no point asking such a question. But if the interviewer is asking you such question, means they are looking forward to hiring you in their company. So, be ready as you may get called for the joining anytime, anywhere. They might say something like, what do you think of the job, position and the company? If you are interested to do the job, then connect your work experience to the job and explain why you have an interest in this job, leaving the previous one. At the closing of the interview, if the hiring interviewer throws on you the follow-up process, it means that you are still running on their mind for the role of their company’s employee. Also, they will ask you when you would like to continue. They will never leave you without knowing how the timeline of the company looks like. If the interviewer focuses on the perks, the benefits the company provides or the other allowances, then they are planning to extend you an offer. Even if they get into a serious discussion about the pay scale with you, means they want to negotiate everything with you so that there is no doubt regarding the policies and rules and also you join as early as possible. If they weren’t interested in you, they might not have wasted much of their time asking you a number of questions or sharing with you vital information about the company. So, if you are finding that they are sharing all the secret information, chill and think about when you would like to join. As a candidate, it is expected from you to speak about yourself so as to put a good impression on the interviewer and often it happens a lot. But, in case, you find that the interviewer is focusing more on the company and tells all about your company, that’s a great sign your interview went well. They are happy with you and trying to sway you towards a positive answer from your side. If in case you tell them that you wish to join, but not as early and you want some time, then it also means that they will make an effort to remind you over and over again to join the organization as soon as you can. Also, the companies never want good and efficient employees to move back and try in any other company with the same salary. So, they try hard and somehow persuades you to join their company. Not all interviews end up with the first round. Many interviews end up after 2 or 3 rounds. So, if you are told to join in the next round, means you have qualified for the first round and there are many chances to get selected for the job. Now, if you are asked to join in the next round, then it’s time to chill and do not ever think about what you answered or how they reacted. Just be happy and join the company when they ask you to do so. If you do not perform well, the interviewers just bid goodbye saying an abrupt thank you. But, if the interview goes long and at the end, the interviewer extends his hand for a firm shake, means they are impressed from your answers. When the company is interested in you, you will be asked things like the amount of time needed for the transitions if required. If the hiring manager is interested in you, he or she will move forward with the question that what steps will be taken to your departure from the current job so that you can assume the new role? Such queries confirm your acceptance as an employee for the company. So, if such questions are thrown at you, then take it easy, because you just nailed it. You need to know that when the interview reaches to the point where you are asked the salary you are expecting means, you have just carved a niche. You just did it and the interviewer is happy to have you as a candidate. Often, this does not happen because if the interviewer is not happy, he will never concern you with the salary or will never extend the question of the salary expectations. This happens only when the team is happy for you and is ready to pay you what you want to receive. When you are not given a firm farewell, but goodbye is very non-interested. The interviewer if lingers on to tell you goodbye means he is not interested in letting you go and you never know, they might want you to join on the spot. There are instances where you get rejected for a job, even after performing very well in the interview. You will be wondered as to what might have happened and you were in such confusion is very common. To avoid any of such chaos in the future, refer to Signs Interview Went Bad article which will help you out. Usually, while in the interview, the candidate always will be curious to know how they are performing or what does the interview think about them. You will be knowing about the result of the interview only at the end, but there are few ways by which you can decide how the interview went. If the interview went very well then it’s fine, but what’s scarier is if the interview turned out bad. 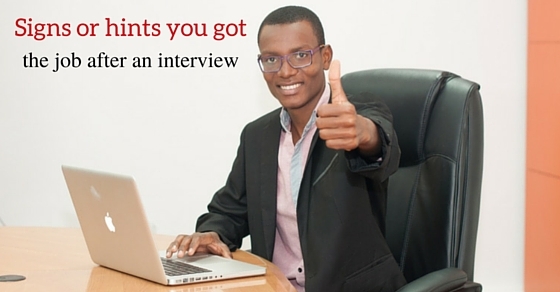 So, above are some of the points which clarify that whether your interview was good or bad. There are many other good interview signs which give an indication of whether an interview went well or interview went bad. Every company has its own rules and policies of taking interviews and also the nature of the person varies from one to another. Still, there are some common gestures which tell about your performance and their response to your answer. It’s you who need to be very observant and know what the other person’s gesture actually means. As these gestures can mean a lot especially in an interview.